As she prepares to open a boarding house, Ree Drummond is road-testing mini bar snacks on the managers. Her first treat is Tallgrass Toffee, a mashup of candy, chocolate and trail mix. Then she makes Chocolatey Apricots, a simple combo of dried fruit and the good stuff. 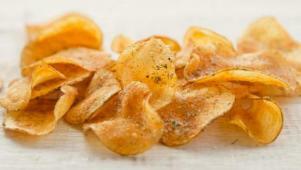 There are cute, homey Sprinkle Cookies and crispy, salty Drummond Ranch Potato Chips, too. She rounds out her boarding house snacks ready for room service with savory, spicy Cowboy Cheese Bites. 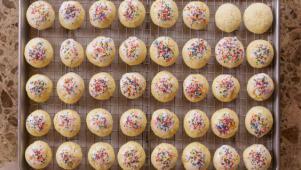 Ree's Sprinkle Cookies get a double-dose of citrus flavoring. 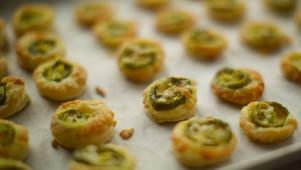 Ree makes snack bites with a kick using puff pastry, cheese and jalapenos. 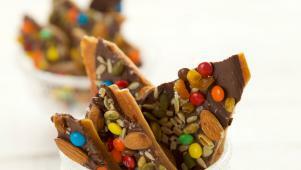 Ree Drummond has a cool trail mix take on toffee. 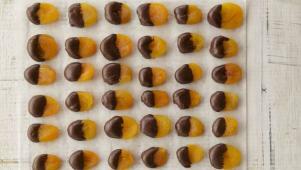 Ree makes a sweet snack by dipping apricots into melted chocolate.